We won't rest, until we've tried them all. Red Velvet from a Box? Maybe not. 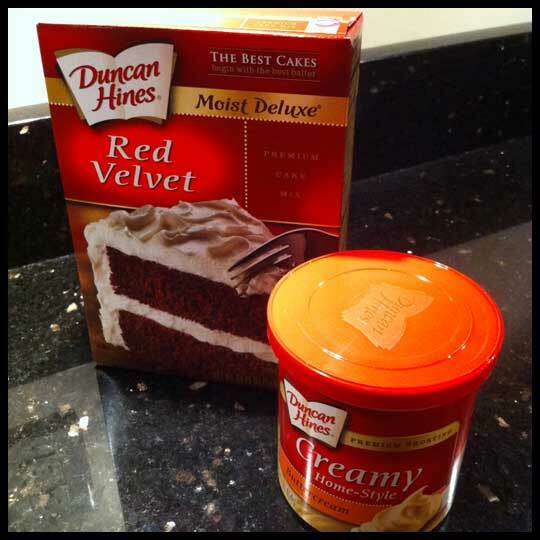 After eating a delicious red velvet cupcake from Nostalgia Bakery in Annapolis, MD, my husband declared that he really likes red velvet cake and ended up bringing home a Duncan Hines red velvet boxed cake mix from the grocery store. Now, I’m all for box cake mix. Duncan Hines and Betty Crocker have been doing it for years, so why try to compete with that? Or at least that’s what I always say. But, red velvet? A cake that very few can pull off successfully? I envisioned a cake that tasted more like red dye than a wonderful sweet treat, which is typically why I don’t like red velvet cake and why I am always impressed when it is done well. After watching “Tough Cookies” on the Food Network, I learned that red velvet cake isn’t suppose to have any dye in it because the red color comes from a reaction with the cocoa. After sharing my skepticism with my husband, he proceeds to read the ingredients and finds that the mix does have red dye in it. But my curiosity was still sparked. Could a boxed cake mix pull off red velvet? So on Thursday night, craving a cakey dessert, I decided to try it out. I was particularly curious about what the batter mix looked like prior to adding wet ingredients. When I pulled it from the box, I was surprised to see what looked like chocolate cake mix (I was expecting red). 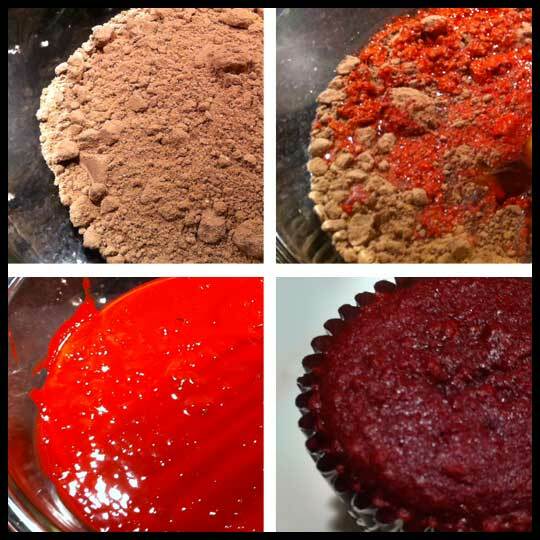 After adding wet ingredients, the batter immediately began to change to a bright red. I tasted the batter, which after avoiding raw batter for the 9 months I was pregnant tasted perfectly delicious. Not like red dye at all, just like chocolate cake but not as rich. After baking, the cake had become a dark red. My husband had selected a buttercream icing to go along with the cake, since he is not a fan of cream cheese icing (I prefer cream cheese icing for red velvet). As with most store bought icings, this one was very sweet. I tried to keep that in mind when icing the cupcakes. My final thoughts on these cupcakes? The icing was too sweet and the mild tasting cake couldn’t stand up to it. Even after tasting the cake separate from the icing, it just didn’t taste like much. Not red dye. Not really chocolately. But not really anything. So I don’t think I’ll be purchasing red velvet from a box again. However, that didn’t stop me from eating two cupcakes in a row! And my husband’s thoughts? He really likes them. I guess that’s all that really matters! 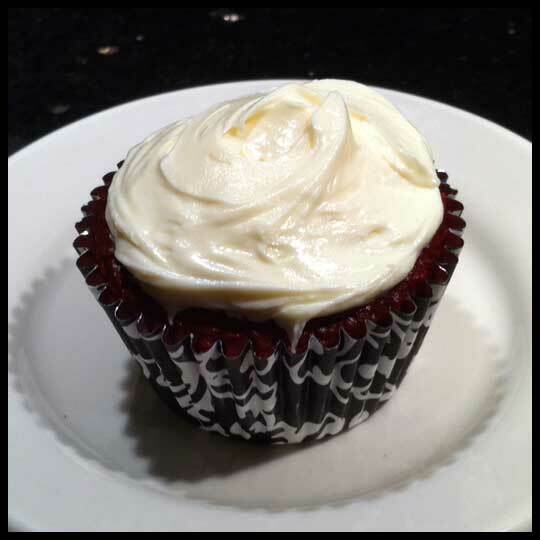 This entry was posted in Baking, Cupcakes, Maryland and tagged Box Mix, Red Velvet by Crusader Jenn. Bookmark the permalink. 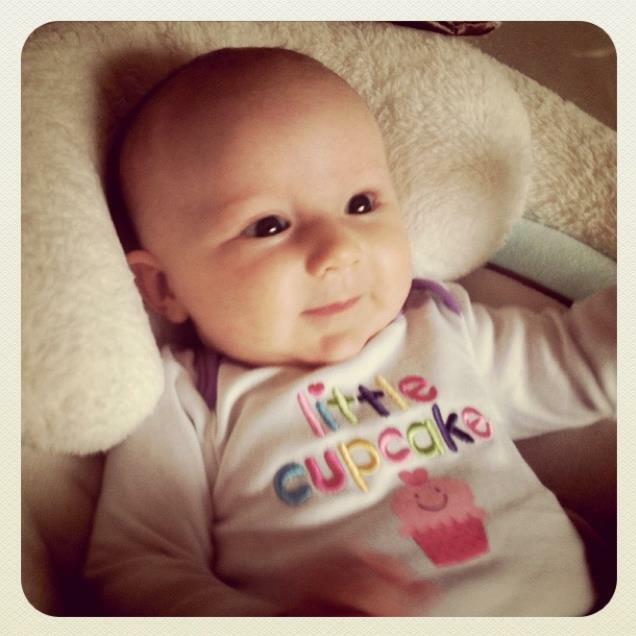 I'm a new mom of a baby girl, learning to stay at home with her, do some graphic design, dabble with new recipes, and taste cupcakes! My first thought when I began reading this post, knowing I often bake with boxed mixes, was “I wonder what brand Jenn bought to bake?” Months ago my sister and I were laughing that we had each recently bought and baked Duncan Hines cake mixes (different flavors). I cannot tell you which flavor I chose, it very well may have been Red Velvet, but I think it might have been a regular chocolate. We both laughed that we had the same reaction, Duncan Hines just isn’t a good mix. It was very dry and not much flavor. Sorry Duncan Hines! I typically buy Betty Crocker or even Pillsbury, but I found the Duncan Hines on sale at the time so I went that direction. All in all, Jenn, I think you could have possibly just bought the wrong brand, or rather your husband did. =) Perhaps you will need to try again with Betty Crocker to compare. Or you just have to make it from scratch. Marina, that is a really great observation. I’m going to tell Jenn that she should do a series on this and maybe try other box mixes. There are some online too, much fancier mixes, but I think we could really go somewhere with this. Thank you! I was thinking the same thing as I wrote that. =) She should try some of the brand name ones you can find in a grocery store, maybe even a gluten or vegan style for those who might need to know and then try one from scratch. If I lived closer and had people to help eat them, I would do this with her. Marina, (it won’t let me reply to your reply, so I hope you see this) you could always help from far away. Especially if you want to try from scratch, since I know Jenn won’t be doing that any time soon. 😉 You both could “soldiers” in the Red Velvet Mission. I’ll definitely need some help on this crusade! I don’t think I could eat that many red velvet cupcakes on my own, especially since I want to experiment with some other ideas I have. But, a series does sound like a good idea and that’s a really interesting point about Duncan Hines not being the best. Thanks, Marina! I decided I would help with this one, if thats cool with you. Making a couple different recipies from scratch. I’ll let you know how it goes. That would be awesome Christina! Thanks! Hello! Thought I would mention some tips I’ve found that work! Try substituting buttermilk for the water in the cake mix, and melted butter for the oil. It really makes a difference in the taste of the cake! Also, you can add some cocoa yourself or instant coffee (just a smidgen) to bring out the chocolate flavor. Great tips! Thank you! We’ll give it a try next time.